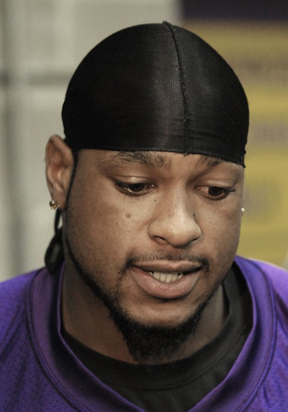 EDEN PRAIRIE, Minn. (AP) — Percy Harvin made it known that he wants out of Minnesota. Vikings general manager Rick Spielman said there’s no way he’s going to let that happen. Unhappy with several issues with the team that drafted him in the first round in 2009, Harvin requested to be traded, a person with knowledge of the situation told The Associated Press on Wednesday. The person spoke on condition of anonymity because of the sensitivity of the issue. A few hours later, Spielman said the organization considers the star receiver a cornerstone player and will work to resolve any issues that have Harvin upset. The situation seemingly came out of the blue this week, surprising many Vikings players and coaches when Harvin voiced his frustrations with the team on Tuesday at the opening of a mandatory minicamp. He is due to make $915,000 in the fourth year of a five-year rookie deal. That total is much lower than veterans Micheal Jenkins and Jerome Simpson, with neither coming close to his production on the field. Requesting a trade now would be a curious move if his main motivation is a new contract. Most players in similar situations first voice their concerns, then threaten to holdout of training camp before going as far as to request a trade. Spielman would not say if money was an issue but also reiterated the organization’s approach to signing players to extensions. Harvin has emerged as perhaps the most versatile and dynamic player on the team. He earned respect in the locker room for his willingness to play through injuries and still produce late in last year’s miserable 3-13 season. In May, Harvin showed up at voluntary workouts despite still recovering from shoulder surgery and spoke of asserting himself as a leader and encouraging other players to participate in the team’s offseason program. He caught 87 passes for 967 yards and six touchdowns last season, rushed for another 345 yards and two scores and also returned a kick for a touchdown during a sensational year. But indications are that Harvin’s issues go far deeper than just money. His role in the offense, which diminished greatly last season when the Vikings reached the red zone, and the organization’s decision to go into a rebuilding phase coming off of consecutive last-place finishes in the NFC North combined with his modest salary all figure to factor into his mindset. Harvin dealt with migraine headaches and numerous other minor injuries as the result of his punishing style of play, missing one game his rookie season and two in 2010, which brought concerns about his durability over the long term. He played in all 16 games last season, establishing himself as one of the game’s top slot receivers and one of its most dangerous kick returners. After making the NFC title game as a rookie, the Vikings have taken significant steps backward the last two seasons. They are centering their rebuild on Harvin, Peterson, who is recovering from a torn ACL in his left knee, and second-year quarterback Christian Ponder. Harvin is far and away Ponder’s best option in the receiver corps that includes non-descript veterans Jenkins and Devin Aromashodu, rookie fourth-round picks Jarius Wright and Greg Childs and Simpson, who will be suspended for the first three games this season after being arrested on drug charges while with the Cincinnati Bengals. After signing tight end John Carlson from Seattle, there has been a lot of talk about the Vikings going to more two tight-end sets to take advantage of him and second-year tight end Kyle Rudolph. That could also be a concern for Harvin, but offensive coordinator Bill Musgrave said he was unaware of any problems Harvin had with the playbook. Musgrave said he planned to get the ball to Harvin even more this season. Harvin attended the team’s morning practice Wednesday, leaving the field before reporters asked questions. Peterson said he hadn’t spoken to his friend about it but planned to have a conversation to try to help smooth things over.